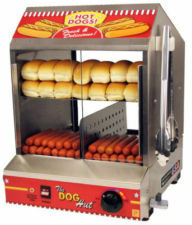 Hot dog Machine and Popcorn machine. Includes 1 hours running time with uniformed staff to serve and kingsize / jumbo hot dogs and buns, all condiments, napkins etc - all you need to do is invite the guests Vegetarian Hot Dog & gluten free hot dogs & rolls option is available on request. The number of hotdogs you need is flexible according to your guest numbers or how hungry they are!